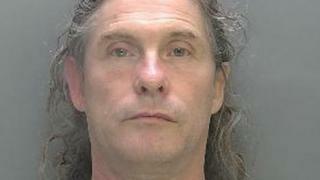 A man who called police to say "I have tried to kill my wife" after stabbing her 10 times has been jailed. William Morris, 51, "lost it" in an argument at his home in Willingham, Cambridgeshire, on 24 November, Peterborough Crown Court heard. Police said that when he answered the door and was arrested Morris said: "I can't believe what I've done". Morris, of Pyrethrum Way, was jailed for 13 years and four months after admitting attempted murder. Police said Morris called officers at 00:34 GMT and said: "I have tried to kill my wife, I tried to stab her". He said his wife was bleeding heavily and the knives he had attacked her with were still in the kitchen. At the police station he gave a "no comment" interview, but admitted the charge on 28 February. Det Con Karen Lunn said that: "No-one should ever have to endure what the victim did that day. "Her life has been changed irreparably but I hope she is now able to gain some closure and move on with her life as best she can." An indefinite restraining order has also been made.